Are you looking for easy do-it-yourself home improvements ideas you can implement now? There are a lot of things you can do to change the look of your home. And you don’t have to spend a fortune to make an attractive home. 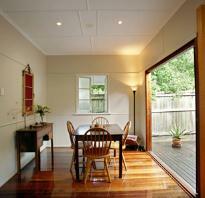 Owning an older-style property doesn’t necessarily mean going without the luxuries of contemporary living. The ideas below show how modern functionality and styling can be successfully integrated into a period home without sacrificing its old-world allure. Easy Do-it-Yourself Home Improvements Ideas You Can Use Now! The ideas used in this airy renovation are simple yet stylish. homesite shows you how to get the look. Successfully integrating a modern addition into an existing post-war cottage is no mean feat. 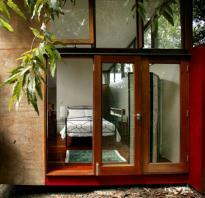 But the owners of this renovated home have done just that by turning to nature for inspiration. To avoid detracting from the period elegance of this home the owners chose a selection of complementary and muted materials and finishes for the kitchen makeover. Although overtly modern, the stainless steel appliances, such as the range hood and oven, are simple in design and unobtrusive. This allows old and new to sit comfortably side by side. 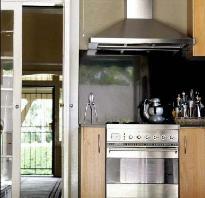 The Omega K24 wall-mounted canopy rangehood with telescopic chimney (60cm or 90 cm) is designed to sit above a cooktop. Its plain design makes it suitable for all styles of home, including period houses. Extension flue kits are also available to cater for extra tall ceilings, which are commonly found in older buildings. The bathroom here looks simple yet attractive. It’s a combination of artistic soft charcoal and marble tiles that you can achieve with a bit of creativity. 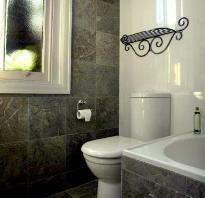 The guest bathroom was updated with soft charcoal and off-white marble tiles. Rather than overpower the area the two-color scheme, along with the large format of the tiles, helps open it up. The lighter tiles were placed on opposite walls and fitted with classic fixtures such as the pedestal basin and streamlined toilet suite. The darker ones were used for the remaining walls and the floor. A good match to the toilet suite used in the bathroom above is the Smartflush Leda 2000 by Caroma. Not only will its sleek design fit in with most bathroom styles but its advanced dual flush cistern will ensure you save water and money. It sits level against the wall so is easy to clean. It’s always a nice thing to be able to see the happenings on the outside without leaving your own living room. With this nifty courtyard manipulation, you can make your weekend turn from boring to more interesting. A modern courtyard has been added to this period home to create a space for outdoor entertaining. The area connects seamlessly with the kitchen via cedar bifolds, which, despite being a contemporary innovation, do not compromise the historic essence of the home. Timber rather than aluminum bifolds was chosen to complement external timberwork. Stegbar cedar bifolds can be stained to enhance the natural warmth of the timber or painted to match existing color schemes. They are suitable for all architectural styles, new and old alike. Bifolds are also a great way of allowing natural light inside, making them ideal for older homes which often have dark and dingy areas that need brightening up. Here, the floor is full of pebbles that matched well with the tiles on the walls. The color palette is close too so if you can something similar, you can make a few changes (with little budget) to get the look. Don’t know how to do it? Don’t worry. 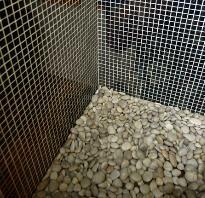 An interesting alternative to tiles are these polished river pebbles, which have been placed in a copper tray. This natural product not only looks good but feels great underfoot, too. Eden Garden Centre stocks a range of local stone products, including the polished variety shown here. If you’re looking for something a little more exotic, Australian Native Landscapes’ collection of imported pebbles – which come in shades such as salmon pink, blue-grey and black – may be able to help. Also, check out hardware stores such as Bunnings Warehouse. The hardwood flooring featured throughout this home creates a warm and homely feel despite its high ceilings and cool color scheme. Using a natural product on the floor has also helped blur the distinction between inside and out. If quality hardwood boards are used and installed correctly, they will last a lifetime. Ironwood Australia offers recycled, reclaimed and new timber flooring products, with board widths ranging from 70mm to 250mm. Color variation moves from deep forest reds to soft golden creams. Recycled timbers have knots, varying grains and other natural imperfections, which all add to their rustic appeal. The timber awning windows used in this extension help increase ventilation and ensure interiors are kept bright and airy. Their simple design makes them a suitable choice for this modern yet historically sensitive addition. If fresh interiors are high on your wish list, then awning windows from Trend Windows & Doors may be just what you need. Their western red cedar frame can be left as is or painted to complement existing color schemes. Chain winders hold the windows in place and prevent slamming in windy weather while maintaining air flow. 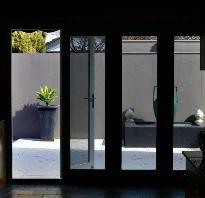 Timber or aluminum flyscreens can be fitted if required. Paving the areas that surround a home’s various entry points is a great way of preventing grubby feet from trekking muck all through the house. In this outdoor space, the owners have chosen small pebbles in lieu of cement grouting between the large-style pavers. 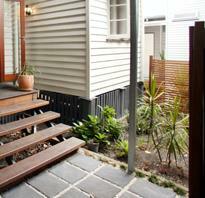 This helps maintain the overall look of the home, which is informal and relaxed. Although not always the most obvious choice, large format pavers are ideal for opening up small outdoor areas and creating an illusion of space. For a similar look, consider Riviera Series clay pavers from Austral Bricks, which are resistant to dirt, spills, and weathering. They come in four earthy colors and are available in a bullnose style (with a rounded edge) for use around pools or as a step tread. Now that you learn a how a few changes can change the look of your home, it’s time to choose one design that appeals to you and implement. Do you have some tips and tricks that you use for the home improvement that you want to share? Have you done any easy do-it-yourself home improvements projects in the past that you are proud of?